This neutral footwear matches (nearly) everything in your wardrobe. A new season means it's time for a fresh new pair of kicks. And what better option to transition to spring in style than some bright white sneakers? Not only are they totally trendy right now, but this neutral footwear also matches (nearly) everything in your wardrobe. Plus, sneakers are the ultimate travel shoe—you can walk around in them all day without having to stop and deal with blisters or sore arches. (These comfortable ballet flats, stylish flats with arch support, and podiatrist-approved comfortable sandals are also great options for spring and summer travel, as well as everyday wear.) 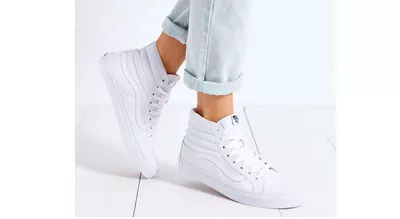 So whether you need sneaks to wear to work or to sport post-gym with your mesh-paneled leggings and cool hoodies, we've found nine fashionable white sneakers for women that will help you conquer the new season with a little extra pep in your step. If you're looking for that quintessential pair of casual kicks, white Converse will do the trick. 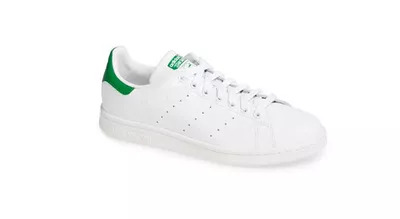 These classic sneakers are a super versatile choice—you can wear them on the weekends while running errands or rock them at the office for a cool, business-casual look. Take your style game to a whole new level with these killer high-tops. You can rock them with rolled up jeans, shorts, or even a skirt for a truly on-point look. Remember these? 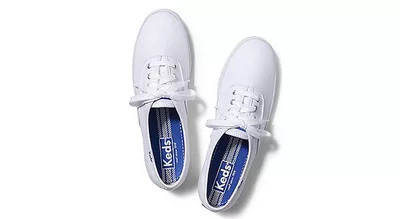 Keds are making a comeback and we're definitely not mad about it—we love the versatility of these cute, simple sneaks. Plus, when they get scuffed, you can easily throw them in the wash—a major bonus when it comes to keeping white footwear fresh and clean. These Adidas may be an old-school style, but modern-vintage sneakers are coming back in a big way. Plus, wearing them with stylish athleisure gives these sneakers an upgraded, hip look. Let them take you from a Saturday morning workout to brunch and beyond by pairing the sleek shoes with some bright, bold leggings. Mix up your wardrobe with a little dose of texture. 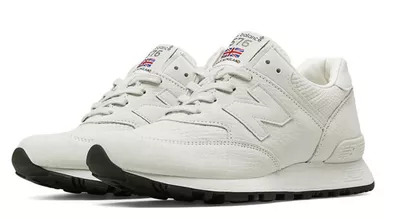 These stylish monochromatic New Balance shoes, featuring an embossed leather upper, can easily be dressed up or down for any occasion. Looking for pair of shoes to easily throw on as you rush out the door? 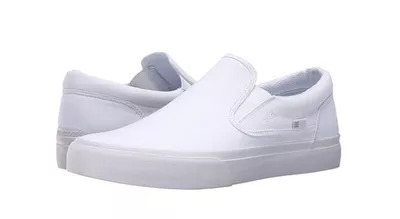 These slip-ons make getting dressed in the morning a total breeze. Not to mention, they look white-hot with skinny jeans, capris, shorts, dresses, and more. This classic aerobics shoe has been updated for 2017 with breathable uppers and a terry lining designed to absorb moisture. They bring a preppy vibe to any active outfit. The Adidas Originals Superstar is still a must-have after 48 years. Pair it with your basic leggings or even with a maxi skirt for a celeb status outfit. A subtle shine makes the Reebok Classic Leather that much more luxe. Padded foam sockliners keeps blisters at bay when you are working the no sock look. Oversize laces—a nod to the 80s—give the Puma Basket Heart Patent a retro feel. This style was originally introduced in the 60s as a basketball warm-up shoe, so they're great for hitting the courts too.